Camp days start and end in the cabins. While our campers spend most of their time outdoors (skiing, sailing and participating in other activities), cabins are their home base, where friendships are forged and memories are made. 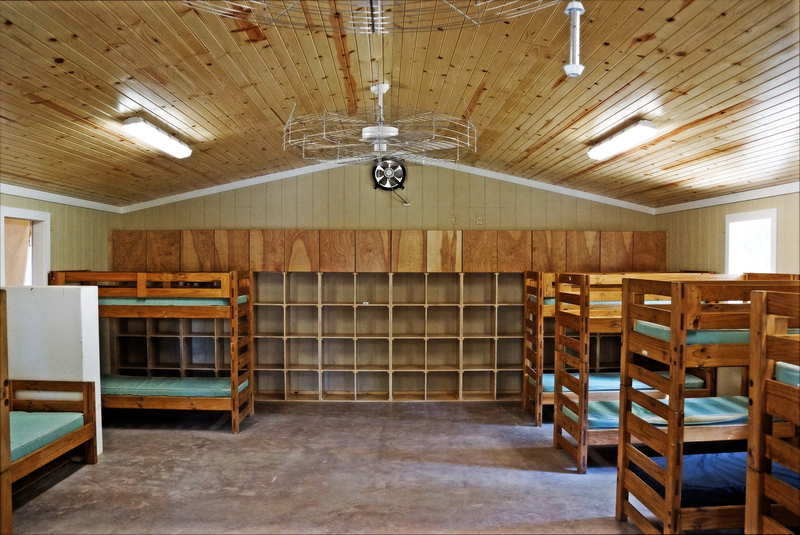 Thanks to generous gifts made to Camp Sabra by donors and alumni and other Sabra fans, including the Staenberg Family Foundation, we are currently replacing all of our cabins. The new cabins are spacious (accommodating 12-14 people), with more storage space, better windows and airflow, and are positioned to face each other, which creates a sense of community in each village. Nine new cabins have been completed so far. We hope to replace all remaining cabins as soon as possible. Would you like to help? Click here for more information about the Home Away From Home Campaign. As part of the camp’s ongoing renovations and updates of our facilities, Camp Sabra opened a new girls’ shower house in 2015, and the new boys’ shower house was completed before the summer 2016 sessions. Both shower houses were generously funded by the Staenberg Family Foundation. These environmentally-friendly structures are spacious, with modern plumbing and lots of natural light. 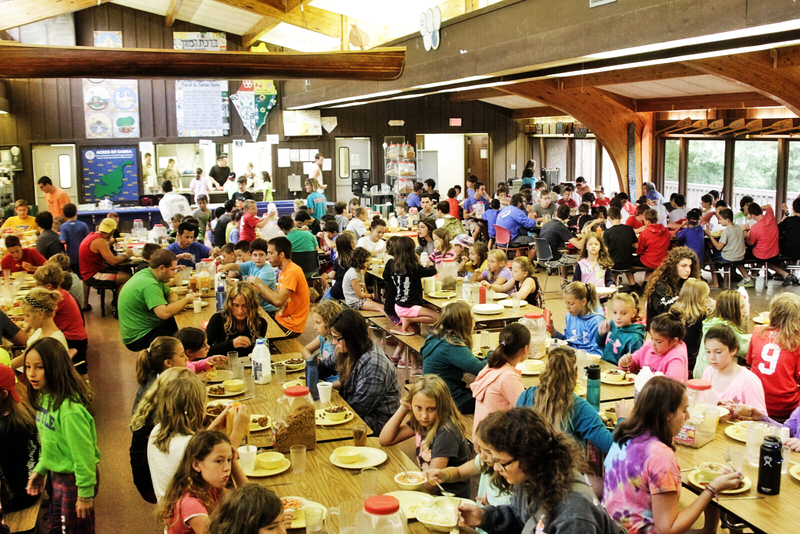 Mealtimes are special at Camp Sabra, and our dining hall is the perfect gathering spot for communal dining and an abundance of ruach! The air-conditioned Dining Hall is centrally located, with large windows to keep campers in tune with the nature around them. Our fully-equipped, kosher and nut-free kitchen allows for preparation of all food onsite. Even our bread is baked daily in our kitchen. The Dining Hall is also home to song sessions, specialty chef programs, Shabbat ruach, rainy day activities and more – it’s the heart of campus! 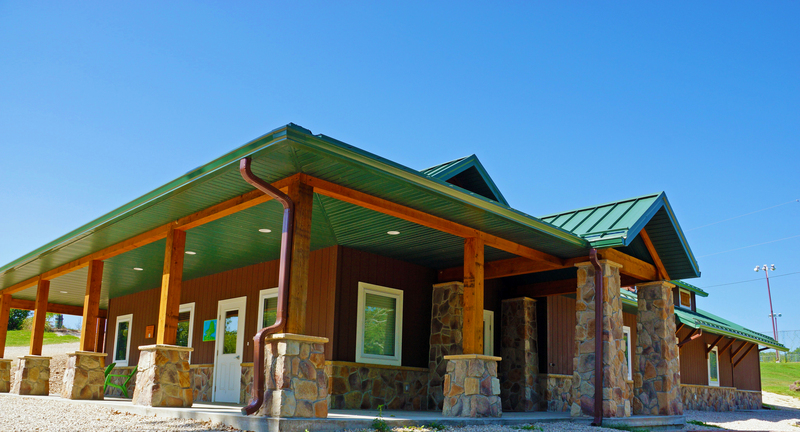 Camp Sabra debuted a new Health Center in 2014. This air-conditioned building helps us to fulfill our promise of putting your camper’s health and safety first at camp and provides a comfortable place to rest in case of overnight stays. The Health Center houses a full-time physician and two, full-time registered nurses. 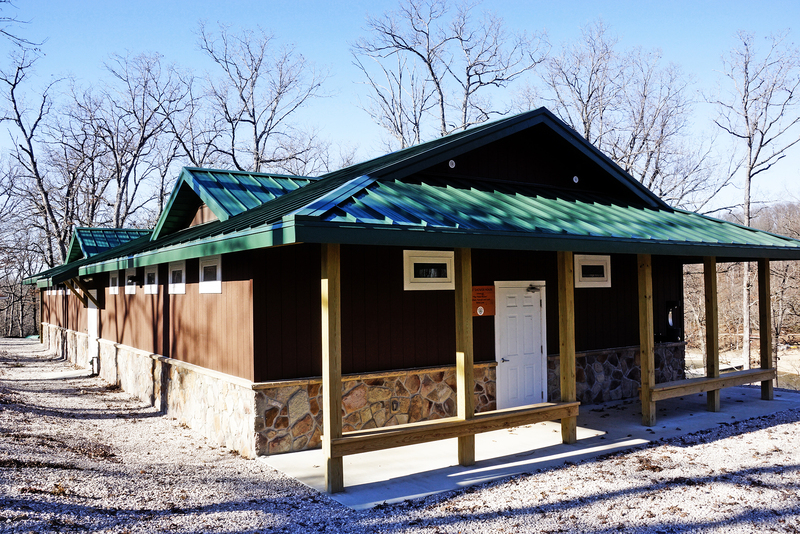 This building is located at the center of camp and is fully stocked to meet our campers’ health needs. 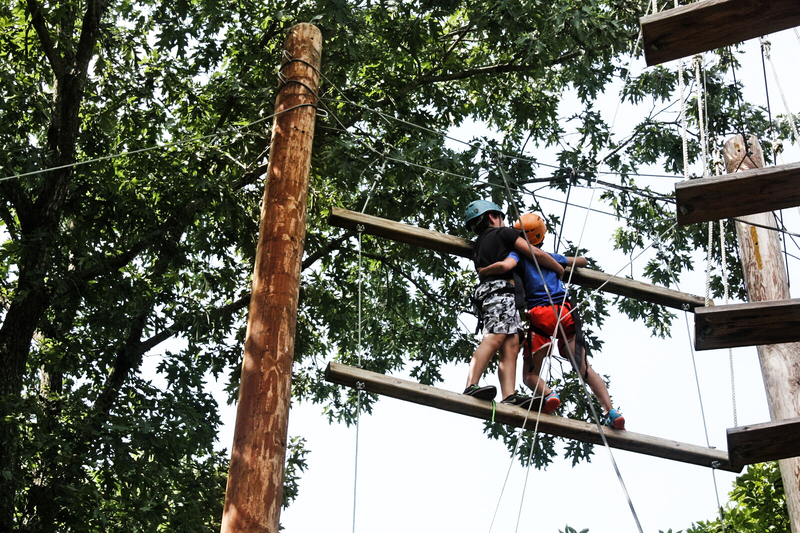 Camp fact: the Health Center is visited more than 14,000 times each summer. The new building and new processes have helped us dramatically reduce the amount of time necessary to dispense daily meds. New in 2016! This nearly 10,000-square-foot, open-air pavilion is used for basketball, volleyball, floor hockey, four-square, pickleball and whatever activities our campers request or create! Additionally, this provides us with another place to host all-camp gatherings (it even has pull-out bleachers). The new Sports Pavilion gives campers a place to find much-needed shade and protection from the elements, too. The Fox Family Theatre houses Sabra’s drama and performing arts programs. This outdoor amphitheater with large stage and allows our campers to come together for song, dance, performance and play. 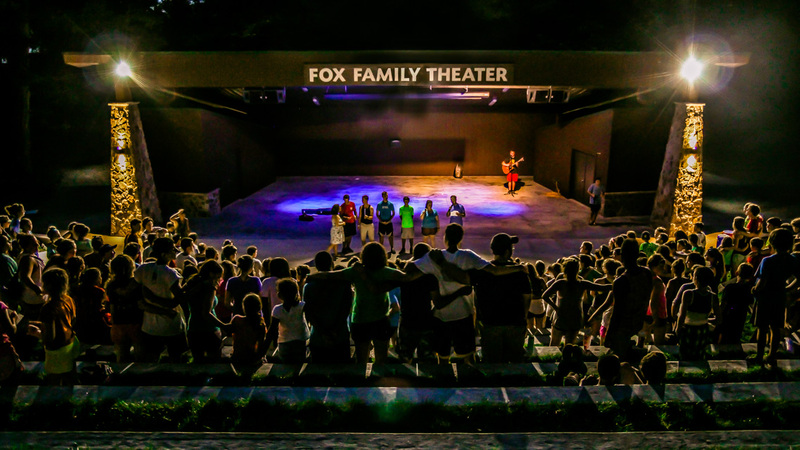 The seating, built into the hillside, provides an audience experience that is aesthetically and acoustically “camp!” Generously donated by the Fox Family Foundation, the Fox Family Theatre opened at Camp Sabra in 2014. 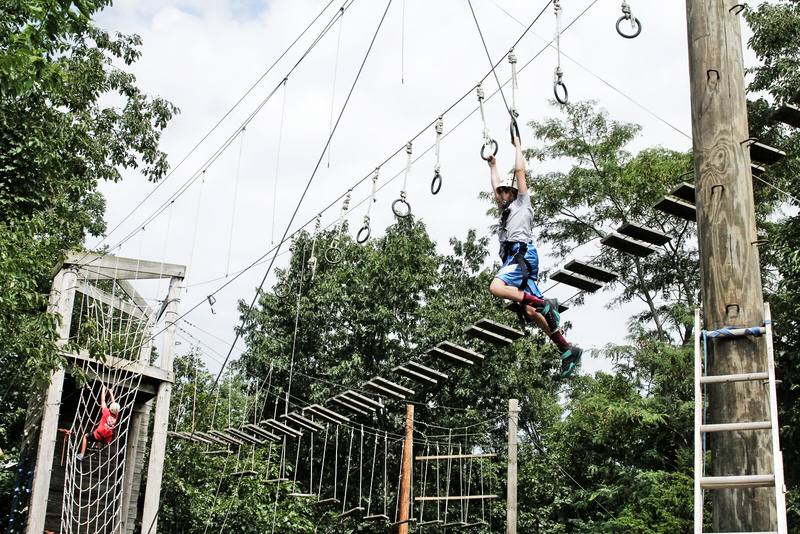 Camp Sabra is home to both extensive low-ropes and high-ropes courses, as well as a two-sided climbing wall and 400-foot zip line. These outdoor obstacles help campers build physical skills, promote problem- solving and encourage bonding with other campers. 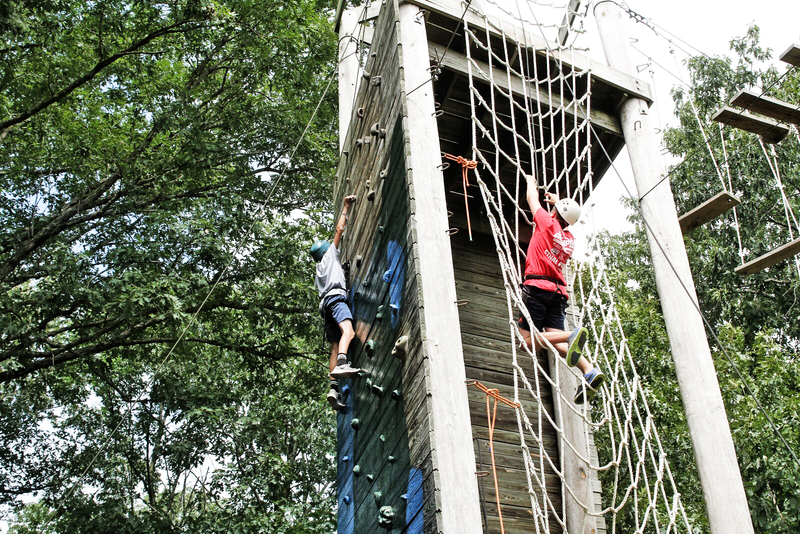 Campers are not required to do any activity, but we do encourage campers to try new experiences, and the ropes course is a real confidence-booster. 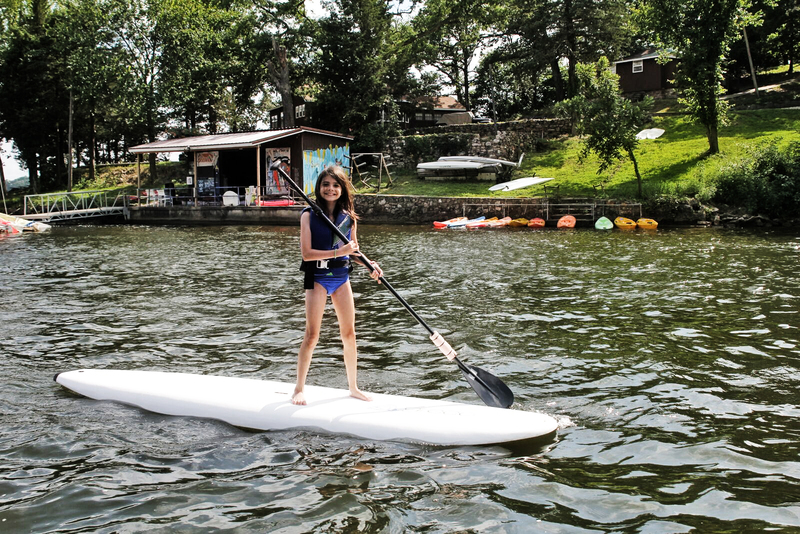 Camp Sabra sits on three and a half miles of waterfront – something no other camp has to offer. 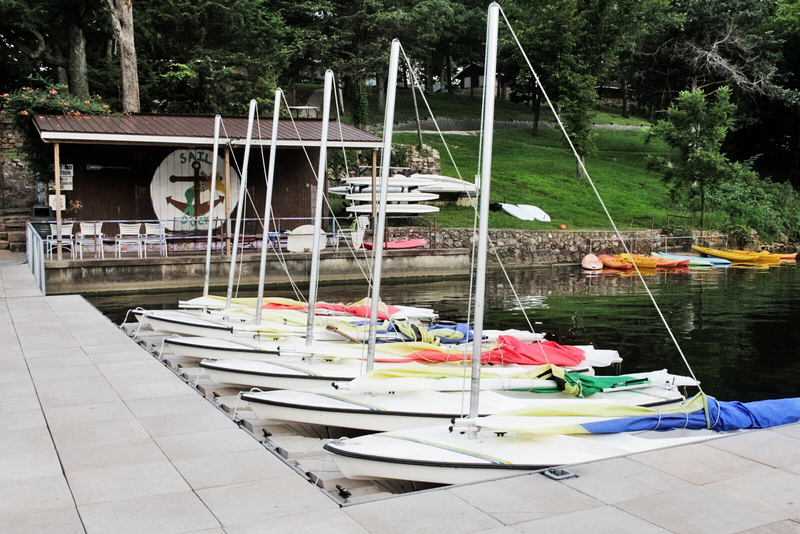 Our sail dock, new in 2014, houses our fleet of sailboats, funyaks, paddleboards and canoes. Our staff are focused on safety and the importance of instruction, and our sail dock was designed to provide campers with a safe place to learn how to use the equipment properly and have a great time doing it! 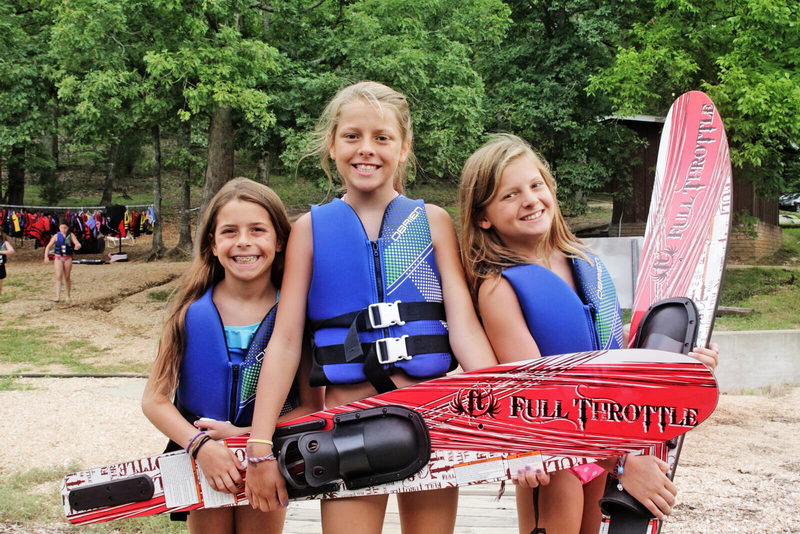 Also on our Lake of the Ozark shoreline is Camp Sabra’s ski dock. Skiing, tubing and wakeboarding are the most popular activities among our campers, so we built our ski dock (new in 2018) to safely accommodate every camper who wants to participate. There is nothing like the smile on the face of a camper who has gotten up on skis for the first time! New in 2014 as part of the ongoing renovation of our facilities, this popular on-the-water spot is home to lake swimming and lots of water toys, including a trampoline, log roll, giant slide, and a rock-it. One hundred and ten feet of slide before you plunk into the Lake. Need we say more?? 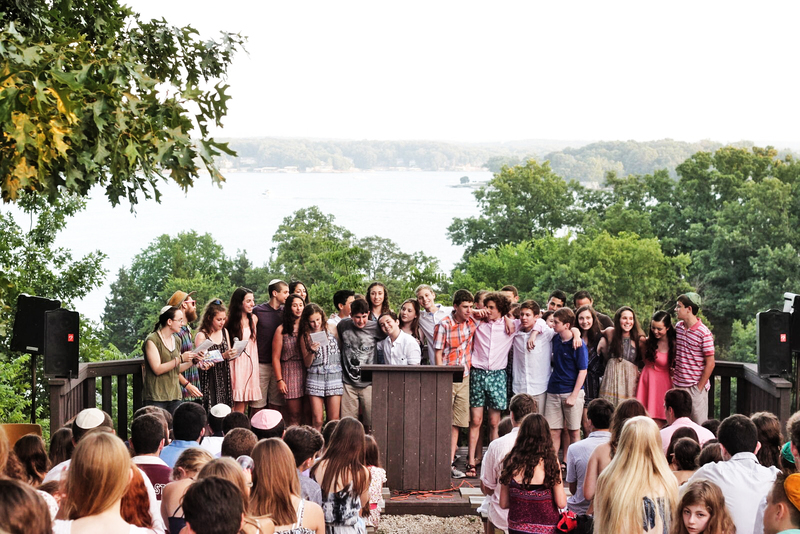 We are very grateful for our natural, idyllic locations for Shabbat services. 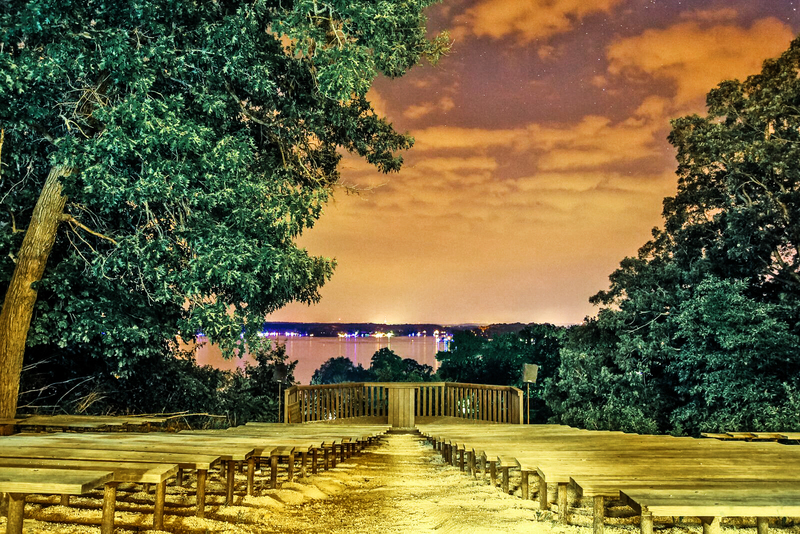 Each overlooks the Lake and offers at least a 180-degree view. 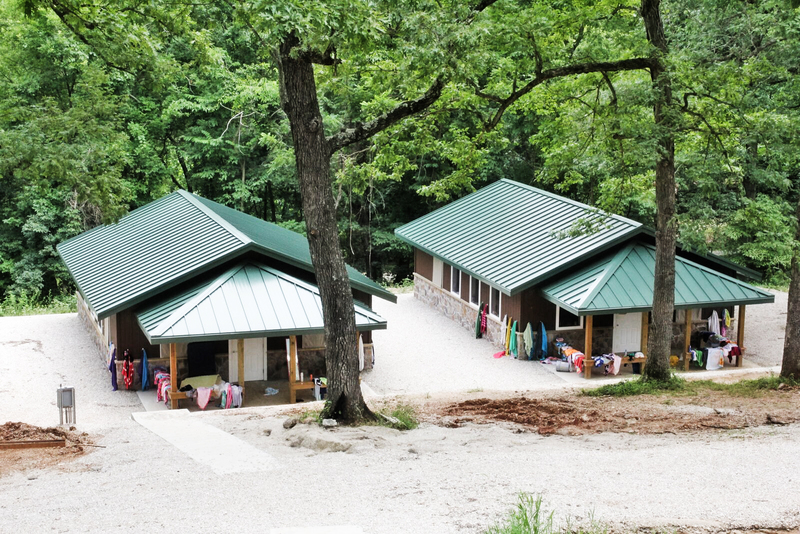 Inspiration point was renovated in 2018 to accommodate our ever-growing camp population.